That would be a new price point for a single BHz if true. Even the seasonal sets at $10 have the extra side extensions. There seem to be no indication of a Mini-BHz or extras. Typical Lego. Have many licensed BHz, sell for $10. Commit to only internal IPs, sell for $15. These don't even have a special printed tile plaque for the base. This price point is just plain wrong. ...and yet the 20 I have listed in my BL store at $8.99 each continue to sit. C'mon Amazon resellers! You're slacking! Somebody already cleaned me out of Captain America, Iron Man, and Belle. this has to be incorrect, right? Has anyone confirmed that? That's a really small number. Emmet is also list as "Walmart.com Exclusive", it does not have the same note on his listing. I'm just going to go ahead and order at RRP. Don't want to risk missing out on these, since I've got the complete collection now. well that possible low production was enough to make me order a couple:) im sure were all looking for benny too now. any new sightings? easy enough to confirm...anyone have a box in hand to read the label? well if it's individually numbered...that would imply a count on the box. sorry...didn't realize that only online orders are available currently. and if we're to believe the listing, it will stay that way as it says they are online exclusives. I grabbed a few just in case. Hope they made 5k only. But how can we order these on Walmart.com if we’re all banned? I just ordered bunch so should be joining you soon. Do you guys think the 5k applies only to Wildstyle or to Emmet too? I don't think it actually applies to either, but I'm not taking the chance it's true. so what number would be reasonable for a "walmart Exclusive" set...50,000? well I know i'm not banned. Supposed to ship to store Feb 8. One of my orders suppose to be ready for store pick up on 6th. Until I see “shipped” instead of “processing” it may still get cancelled. And yeah, not really banned but many ppl can’t/couldn’t get any orders through for last couple months. for the 1st time ever, I'm paying RRP for Brickheadz, where did that "What sets would you pay full price for" thread go? Actually people who can't get orders through are banned. 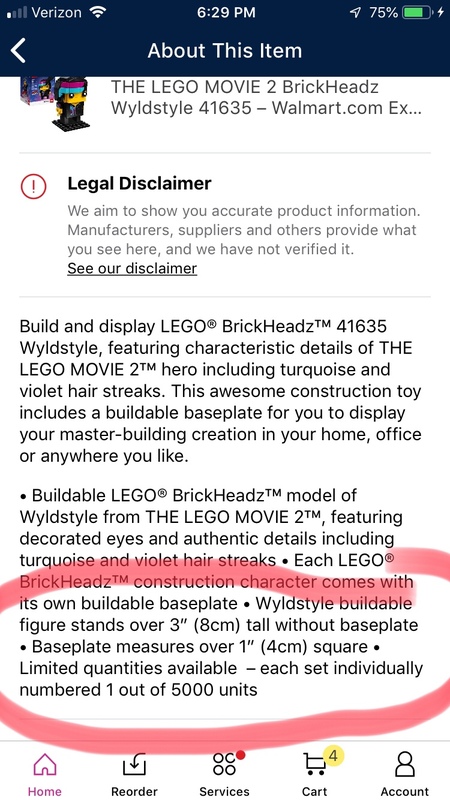 Walmart will tag your account as a reseller at some unknown to anyone point and you are banned from any LEGO purchases.